The heart of the four metre tall curved concrete shell is knitted. The structure's formwork is a textile supported by a steel cable-net. The prototype KnitCandela marks the first application that this technology is being used on an architectural scale. The structure is an homage to Spanish-Mexican architect Felix Candela (1910-1997) and a collaboration with Zaha Hadid Architects Computation and Design Group (ZHCODE), and Architecture Extrapolated (R-Ex). The technology was developed at ETH Zurich. Following a digitally generated pattern, an industrial knitting machine produced the shuttering of the formwork for the shell structure: in 36 hours, it knitted a fully shaped, double-layered 3D textile consisting of four long strips. The lower layer forms the visible ceiling – a designed surface with a colourful pattern. The upper layer contains sleeves for the cables of the formwork system and pockets for simple balloons, which, after the entire structure is coated in concrete, become hollow spaces that help save on materials and on weight. Manufacturing a formwork for such a geometrically complex structure using conventional methods would cost substantially more in both time and material. In the museum's inner courtyard, the knitted formwork was tensioned between a temporary boundary frame and sprayed with a specially formulated cement mixture. This initial layer was just a few millimetres thick, but sufficient to create a rigid mould; once it hardened, conventional fibre-reinforced concrete was applied. The knitted fabric was brought to Mexico City inside two suitcases – as normal checked baggage. The knit weighs only 25 kilograms and the cable net around 30. Taut in between the boundary frame, they supported over 5 tonnes of concrete curves. The technology behind KnitCandela was developed by Mariana Popescu and Lex Reiter as part of Switzerland's National Centre of Competence in Research (NCCR) in Digital Fabrication research project. Mariana Popescu is a doctoral student with Philippe Block, Professor of Architecture and Structure at ETH Zurich, while doctoral student Lex Reiter studies with Robert Flatt, Professor of Physical Chemistry of Building Materials. Popescu's research shows that employing knitted textiles in architectural applications cuts down on material, labour and waste, and simplifies the construction process for complex shapes. Matthias Rippmann, project manager for KnitCandela and senior researcher in the Block Research Group, says: "It took only five weeks from the initial work until completion – much less time than if we were using conventional technology." KnitCandela also represents an evolution of the flexible forming system developed for the HiLo roof: a doubly curved, thin-shell concrete structure the Block Research Group developed for Empa's research and innovation building NEST in 2017. 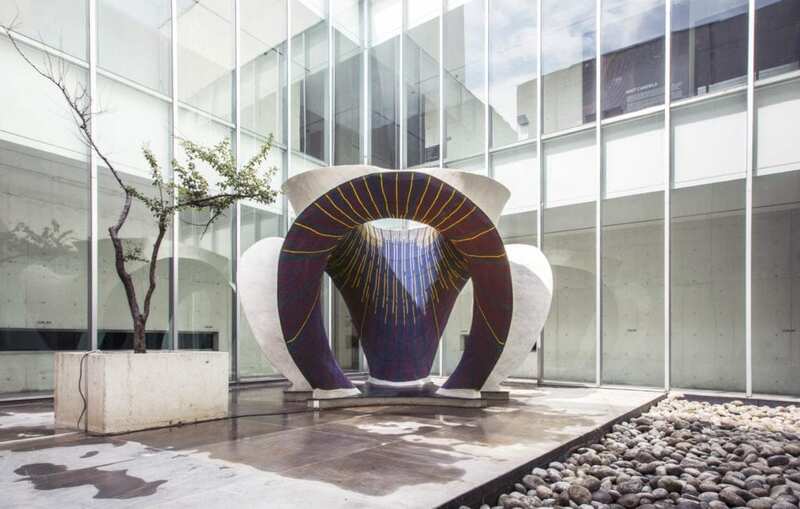 For KnitCandela, the ETH researchers produced the knitted shell in one go, whereas HiLo's shell was made of a network of steel cables and a sewn textile. Popescu says: "Knitting offers a key advantage that we no longer need to create 3D shapes by assembling various parts. With the right knitting pattern, we can produce a flexible formwork for any and all kinds of shell structures, pockets and channels just by pressing a button." For the construction industry, 3D printing is a major topic. Philippe Block says that, to a certain extent, his group's pioneering method is a new form of 3D printing, "only it doesn't require a completely new kind of machine. A conventional knitting machine will do just fine."